The water flowing from Lake Allatoona offers many benefits. Formerly flooded parks are reopening, residents around the lake can reach their docks, hydro-electric generation is humming away and the lake is approaching full summer pool. Our friends with the US Army Corps of Engineers at Allatoona Lake (USACE) reported the lake at 846.52 feet about sea level at 8:15 AM on March 20, 2019, the final day of winter and/or the first day of spring. That’s about two feet lower than the reading at 4 AM on March 18th. 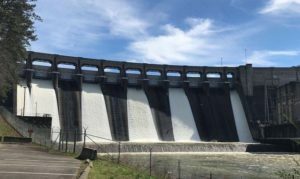 The USACE continues “around the clock spilling” and power generation at Allatoona Dam. Water flowing from Allatoona means several parks and boat ramps are open once again. Payne, Galt’s Ferry, Stamp Creek and Blockhouse Ramps are open for public use. With the exception of 10 sites, all camping is available at McKinney Campground. A tentative date for the opening of Sweetwater, Payne, McKaskey and Victoria Campgrounds is Friday, March 29, 2019. No beaches are currently open to the public. The Overlook at the Project Management Office from 8:00-4:30 daily. Coopers Furnace Day Use Area from 8:00-8:00 daily.